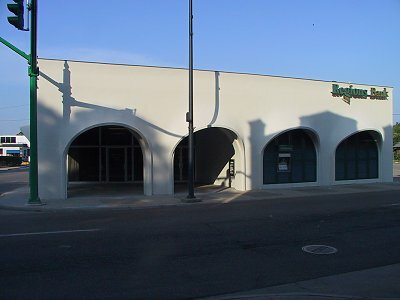 (Southeast corner of Center Street) One of so many buildings that upon view reveal themselves to have once been filling stations. 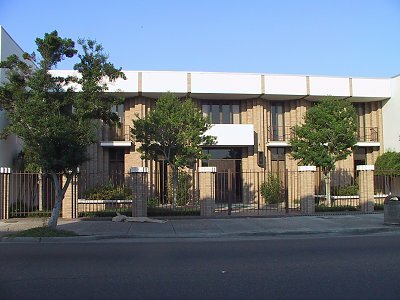 Amongst other things, this building has been offices for a thrift institution. 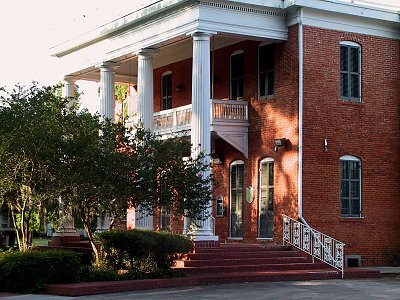 Now houses administrative offices for Shadows-on-the-Teche historical property. 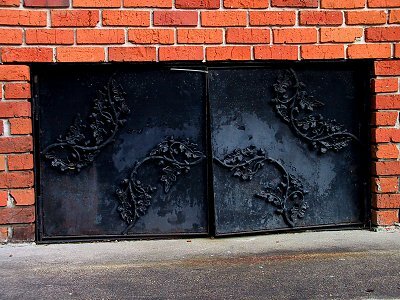 Detail of what I am guessing to be coal chute doors on west side of the above building. 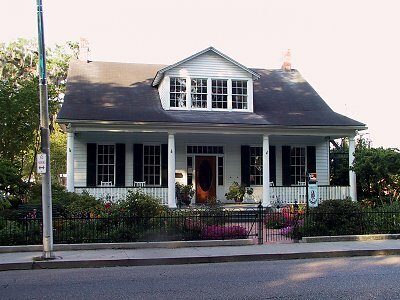 Old home having new life as Le Rosier, a bed and breakfast with upscale evening meals on the weekends. 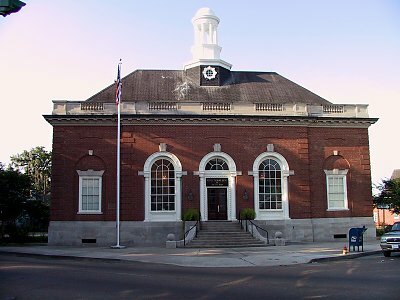 The old post office, now an insurance office, built in the same Georgian revival as St. Peter's Church; the cupolas are similar. 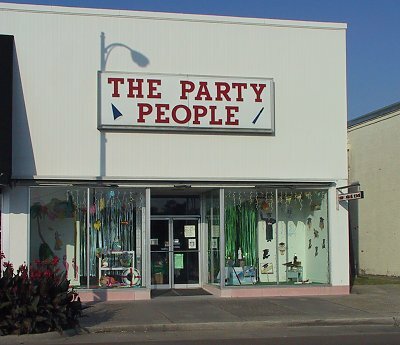 When I was in grade school, this was an applicance store. 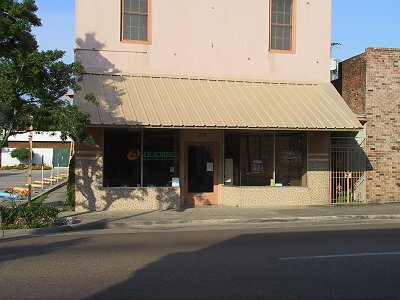 It has been a bank office for many years now. 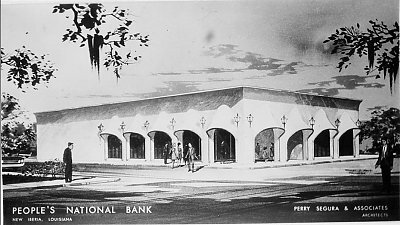 Historic view: Artist rendering of redevelopment into bank building. Antiques. 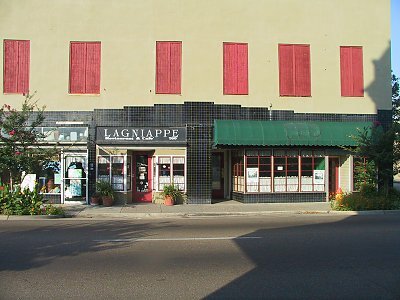 In Sept., 2008, I heard from a gentleman who had opened what he assumed was New Iberia's first gay bar, Buddies Lounge, here in 1985, and he reminded me that this had also been the site of the Sugarcane Lounge in the 1960s and then in the 70s was Pat Murphy's Le Dump Club (an oyster bar, with Pat himself entertaining the patrons on one side). According to my correspondent, another proprietor followed him with a gay bar that was open for a couple of years, and that featured drag shows. 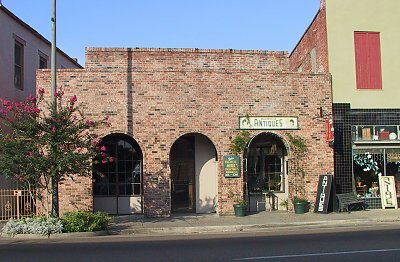 More antiques, and a delightful cafe for those liking a casual lunch. Also evening meals on weekends. 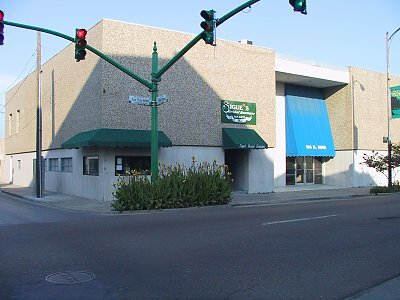 One part of this building was a music and record store when I was a teenager. 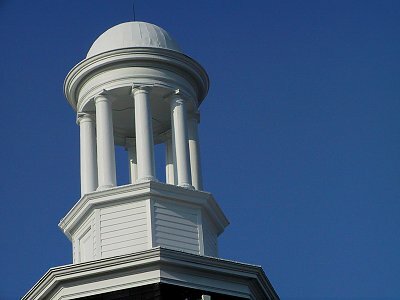 Beneath the facade, there is a beautiful old building waiting to come out! Once bank building offices; I'm not sure what's in there now. 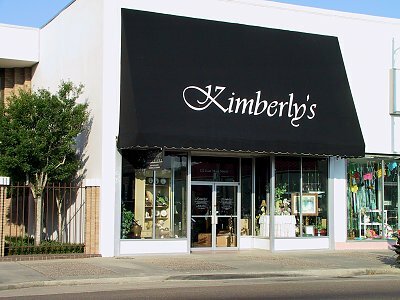 Kmberly is a talented designer who recently added this retail shop to her activities. 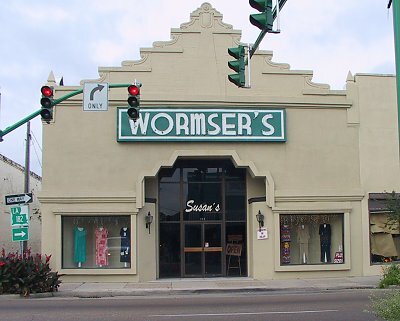 At one time, this served as a bargain annex for the Wormers' store across Church Alley. 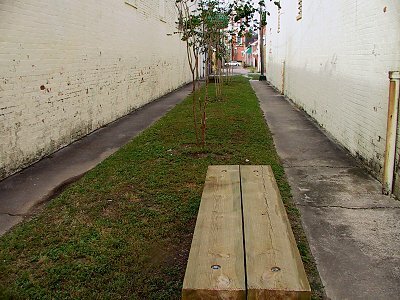 Church Alley, with the recent addition of bench seating between the walls. 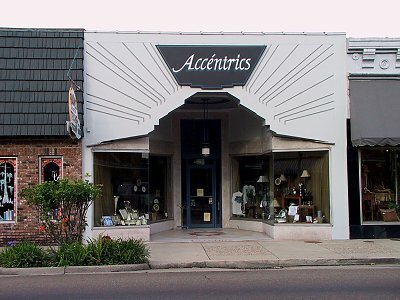 Closed only within the last few years, this was once one of the fashion spots in New Iberia, especially for men. 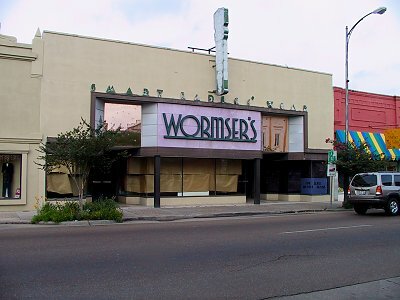 Another part of the Wormsers store, with wonderful art deco facade. Note the lettering, "Smart Ladies Wear." 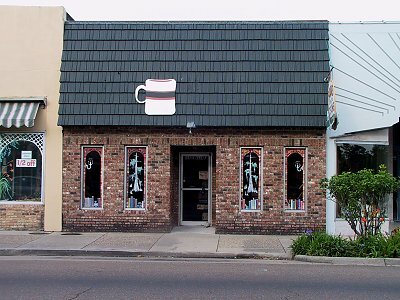 Nowadays serving as a fun destination for kids and the kid-like; you can make your own ceramics, etc. 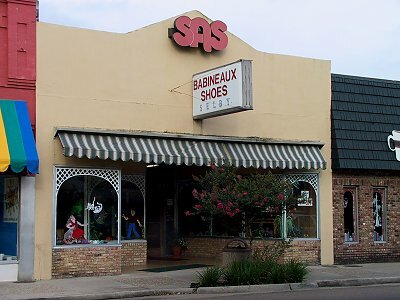 Lloyd Babineaux is at least the second generation of that name to sell shoes in New Iberia. 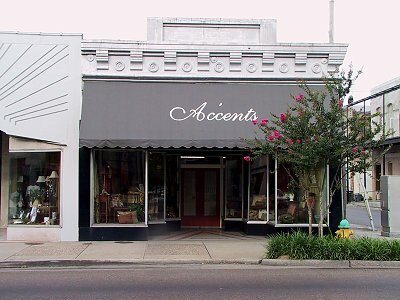 This has had several lives as a retail location. 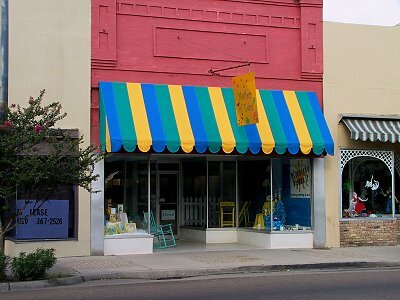 This latest represents a move of a business that a woman had in her home, and which so far is flourishing in its downtown home. There have been various sandwich shops, etc. here over the last couple of decades, varyingly good or bad. 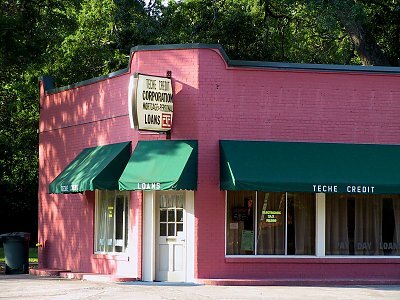 Now the new home of Books Along the Teche. 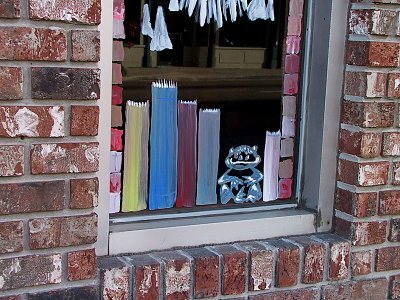 Detail of window painting for bookstore. For dozens of years this was Bowab's, a sort of house of matronly fashion, reborn as something hip for the home.